It is a mystery to me why some companies (often the ones who find themselves eventually dying away) will react to a downturn by cutting marketing expenses. Cutting expenses is a super smart thing to do, but you should NOT cut back on your marketing. 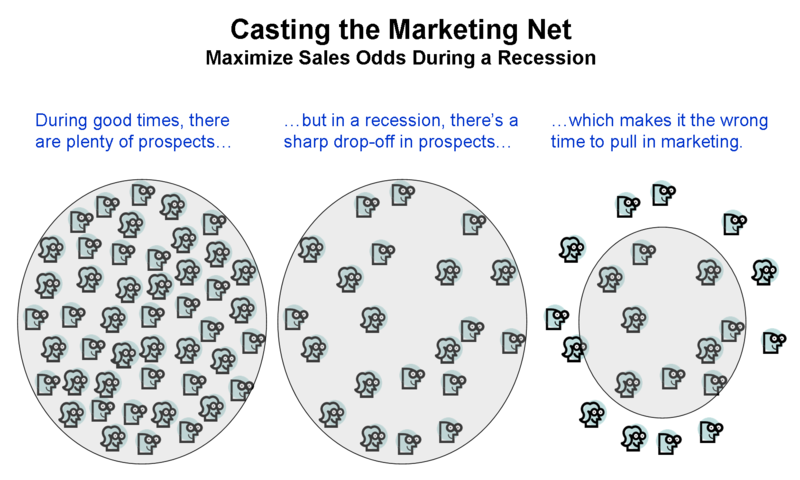 In the world of business sales, you cannot predict which prospects will become sales. But, you know that you need touchpoints with companies. Which prospects will turn into customers? Hard to predict that. One reaction to the reduced sales that accompany a recession is to cut back on marketing. Unfortunately, that’s just doubling down on your problems. There are fewer bona fide prospects out there during a recession as companies cut back. Which increases the value of each remaining prospect. Thus, if you reduce the span/frequency of your marketing efforts, you’re going to miss some of the remaining prospects in the market. If you reduce the number of prospects with whom you engage, you can predict the effect on your sales. That being said, there are wonderful opportunities to do more with less in terms of marketing, thanks to the rise of social media. Jeremiah Owyang and Chris Brogan can tell you more about how to do that. Hutch – Agreed. And your graphic is a great illustration of it. In fact, I have long held that the best time to capture market share is during an economic slowdown, and you can’t capture share if you are cutting back on your marketing efforts. It will be interesting to see who does invest in marketing in the coming year or two – and when we do it will become clear that they are out to take share. Wow, killer illustration. Really demonstrates the concept well. Good job. Non mainstream idea that makes a lot of sense! The issue with marketing expenses is that 1) it’s difficult to assess it’s ROI and 2) its impact is often in the mid-term (read: after the manager has moved into a new position and hence does not bear the impact of his decision…). Hence, it’s an easy target for cost cutting… However, the opposite holds true. During boom times, marketing expenses can increase a lot without necessarily a return on the marginal expense. Mark – I agree. If a company can make a move during these down times, they’ll be well-positioned when we see things bounce back. Thanks David – your post was a good one for thinking about this issue. Wallen’s – definitely better to take a scalpel to things, not a chain saw.